First Noble Garb - for 100 degree weather? Help! My arm is being twisted (it's not too difficult lol) into being on the court for my local faire, when I've been a peasant for the past two years. We're a small faire with a small budget with a time period of 1576, so even the court costumes aren't very elaborate - only Queen Bess wears silks or large ruffs. A certain amount of historical accuracy is sacrificed in the interest of not falling over of heat stroke. I was thinking of a nice blue mid-weight cotton blend with a sheen for the body of the dress and a brocade for the part of the underskirt that shows and for tabs/shoulder roll decorations. would that high-necked chemise be appropriate? Do y'all have any experience with that pattern? What headgear should I make that would vaguely match the dress - is it more of a french hood or Elizabethan hat kind of deal? Any suggestions for blogs or resources? Re: First Noble Garb - for 100 degree weather? Help! Although I'm not a sewer or dress noble, I will pass along the advice to wear natural fabrics in really hot climates. As soon as I could afford to, I had a linen chemise made for me and I am sooooo happy with it. If you wear the polyester costumes, those don't breathe at all and you will regret it for sure. Comfort over h/a for sure. I'm sure others will chime in about the pattern you wish to use. Pop into chat if you want to chat....I'm usually on in the evenings. Hello and well met, songbird. Having met the designer of this well recognized Simplicity pattern, I have not used it myself. It can be made using Linen/Cotton blend fabrics. In the type of heat you are taking about, natural fibers will be your best bet. Medium weight should suffice. Stay away from heavier weight fabrics like Chenille Brocades, Upholstery weight fabrics, anything with Viscose and Polyester. Chemises are best made in 100% linens. As well as Corsets. I use Cotton Canvas Duck for my under layers with boning, plus my fashion fabric and lining layers which are 100% Cotton. Same for my hooped slip or Farthingale. Wearing all Natural fibers for garb in any kind of heat will not only keep you more comfortable, it will protect your skin overall from evaporation. Though do stay hydrated. 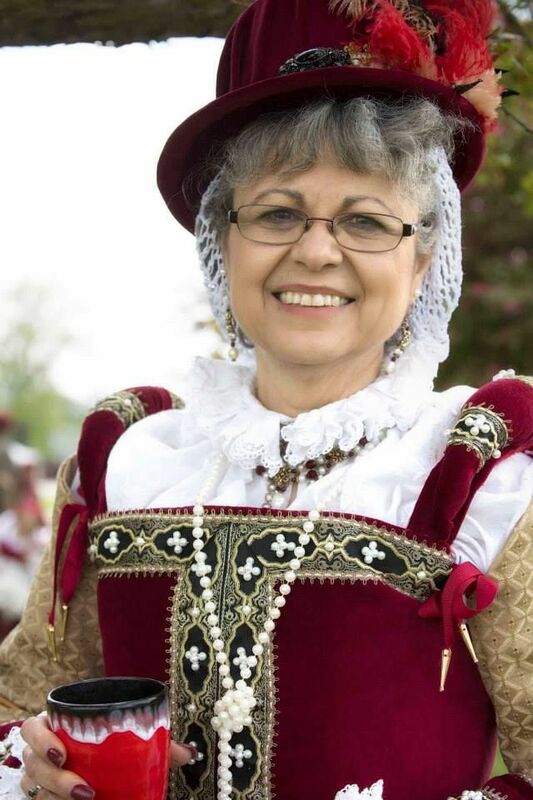 If your faire is not going for full Historical accuracy, it should be permissible to wear high necked chemises with the neck open and gowns without sleeves. I have seen at faires like Bristol, where it can get into the upper 90's with high humidity where the Nobility are sans sleeves and opened chemises at the neck to be cooler. Hats can be French Hoods, Tall Hats, Italian bonnets. Wear a snood or Caul of some kind with it. A gown ensemble I made in 2015 from a medium weight Cotton Brocade and Silk contrast that I have worn in temps in the mid 90's. The sleeves are detachable as they hook and eye into place. I made sure I stayed hydrated, took my time getting places, and used a Parasol for added shade. My next question - do I necessarily need to make a separate corset, if I put some boning in the bodice? I wear a size 32AA bra, so there's isn't exactly a lot of support needed lol. My peasant costume is plenty supportive and it's just a kirtle with four pieces of boning in the front. After some scrolling through Pinterest, I'm thinking of making an "escoffion" style hat, kind of like a large pillbox cap that sits at the back of the head but with a pointed front. It's done, and I survived the fair! I did end up making a corset to go underneath the dress, and my friend Lauren pitched in to help with a hat. I wrote up the dress diary at https://kirtletheturtle.wordpress.com. In the photo below, I'm second from the left.